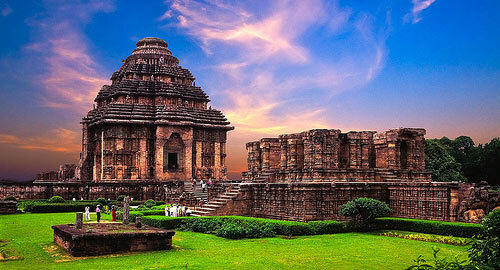 The state of Orissa in eastern India offers some of the finest examples of ancient Indian temple architecture. Bhubaneswar (or Bhuvanesvara), which is the state capital, itself has many magnificent temples, the most notable of which is the Lingaraja temple. It was built in the 11th century AD and it is still being used as a place of worship. The other famous temple is Konark temple:The temple is designed in the form of a chariot with huge sculpted wheels that have become an integral part of ethnic jewelry, art and crafts of Orissa. This chariot of Surya, the Sun God, driven by seven horses is a striking example of Aryan influences on Orissa's architecture and lifestyle. Jagannath Temple in Puri is on of the most revered pilgrimage destination in India as it is one of the dhams (abodes) of the divine in India present in the four cardinal directions. The temple architecture has been restored to its full glory so that you can appreciate the influence that the 241 m high spire of the temple has on the state of Orissa. Puri is also known for serene long Beaches. On arrival at Bhubaneswar Railway Station or Airport our representative attend you. They help you to transfer to Puri. On arrival check-in to the hotel with warm welcome. Evening enjoy at hotel's exclusive beach. Stay overnight at hotel/Resort. After leisure breakfast visit Ramchandi that is about 15 kms along the beach, on the bank of the river Kushabhadra. Goddess Ramchandi, the presiding deity of the Konark region is worshiped here with reverence. Visit Sun Temple Konark, dedicated to Lord Surya, the Sun God. Enroute visit Chaitana that is stone carving artisan village. Stay overnight at hotel/Resort. Early morning wake up call, transfer to the most awaited Lord Jagannath Temple, 12th Century temple is known for its annual Rath Yatra or Car Festival. Thereafter go to the grand road called Bada Dand which is shoppers delight. Back to hotel Afternoon visit to Artist's village Raghurajpur, 25 kms away that is popularly known for its Patachitra, artists have revived lost art in fascinating paintings & palm etching being recreated by deft hands of craftsmen. By evening return to the hotel. Overnight stay at hotel/Resort. Morning check-out and proceed to Bhubaneswar. En route visit Pipli Village - one of the most important cottage industries encouraged by creation of appliqué work. Thereafter visit to Dhauligiri, the famous Japanese temple on the hill. On arrival at Bhubaneswar check-in to the hotel. Afternoon visit to Rajarani and Mukteshwar temple followed by city tour of Bhubaneswar with shopping if time permits. Stay overnight at hotel. Leave for a post-breakfast city sightseeing tour. Start tour with Chilka, enroute visit Nandankanan Sanctuary and Biological Park, established in 1979, offering its inhabitants a true feel of their natural habitats, Gharials (crocodile) and White Tigers. This sanctuary provides the facilities of Jungle Safari. Thereafter proceed to Chilka. On arrival check-in to your hotel. Chilka Lake is Asia's largest brackish water lake. Dotted with beautiful islands, it has the richest variety of aquatic fauna and it is a bird watcher's paradise where migratory birds arrive in winter from Siberia. Visit to goddess Kalijai Island by boat. Evening back to hotel. Stay overnight at hotel. Morning after breakfast check-out and depart for Bhubaneswar, en route visit Khandagiri and Udaigiri -the major Orissan historical monuments after that visit Ashoka's rock-cut edict, Khandagiri, with its 15 Jain caves will be on the left and Udaigiri, with its 18 caves on the right…including famous Hathi Gumpha (Elephant cave) with its famous inscription of Kharavela. Later on proceed to Bhubaneswar, on arrival check-in at hotel. Evening at leisure or shopping. Stay overnight at hotel/Resort. Morning after breakfast, check-out and proceed to Railway station or Airport with sweet memories for your onward journey.